operates in more than 600 cities worldwide is set to become a partner for the upcoming HBL Pakistan Super League 2018 after partnership signing with the Pakistan Cricket Board (PCB). This signing marks the brand's commitment to enter the cricket arena for further support in the third edition of the Pakistan Super League (HBL PSL) 2018. 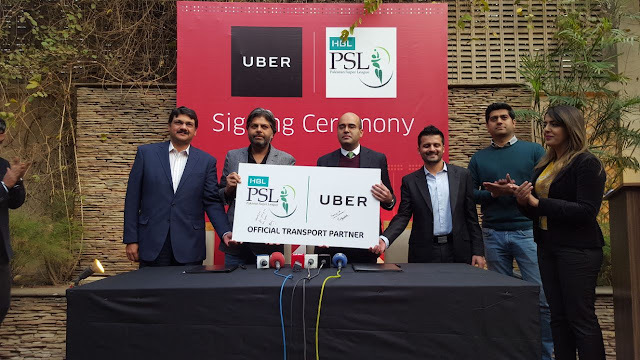 A signing ceremony took place between Uber Pakistan and TransGroup – the sports agency, which has rights to cricket in Pakistan and abroad. “HBL PSL provides brands one of the biggest promotional platforms, and I am glad Uber is keen on supporting the tournament and Team Pakistan’s journey. We are delighted to associate with Uber for a one-of-a-kind partnership in the transportation category to provide an unmatched viewing experience to fans,” added Sohaib Sheikh,SGM – PCB. Apart from helping millions of Pakistanis move around the seven cities by offering access to reliable and safe rides, Uber is utilizing its platform to support the community on a greater level. As a responsible corporate organization, Uber works on the fundamental of giving the community back with every opportunity that comes its way. Currently, over tens of thousands of drivers are using the app to be connected to part time work, and the number keeps growing every month. Uber is evolving the way the world moves through its app. By seamlessly connecting riders to drivers at the push of a button, we make cities more accessible, opening up more possibilities for riders and more business for our partner drivers and transportoperators. Uber's rapidly expanding global presence continues to bring people and their cities closer and is currently providing service in more than 600 cities across 77 countries in six continents.